Seriously! It’s done. An actor like model, which uses graphic lambda calculus for doing distributed computing (i.e. parallel, asynchronous, no controller) . No evaluation needed, everything is local. There is no signal circulating far through the wires, only small local exchanges. In this respect it resembles to what is happening in chemical reaction networks, but it goes much further than this. Looks perfectly feasible, needs angel investor. UPDATE: Let me add a bit more details about this. The awesome thing is not in the actor model side, alone, nor in the graphic lambda calculus or chemlambda alone. Is in the combination of those. The graphic lambda calculus brings the possibility to do distributed computing (and even far away from the usual logic realm, into the field of computing with space, see A me for space). The space which is needed by graphic lambda calculus is, of course, the network. But the network lacks an essential ingredient of space: the proximity relations. This is where the actor model is useful. Secondly, it is well known that in the usual sense computation needs two ingredients: reduction and evaluation. They appear under a form or another in any computation model I am aware of, excepting the one of graphic lambda calculus + actors! Here, only local (if we rely purely on chemlambda instead of graphic lambda calculus) reduction moves are used, after an initial stage of preparation of the computation. in the understanding of the rewiring mechanism. 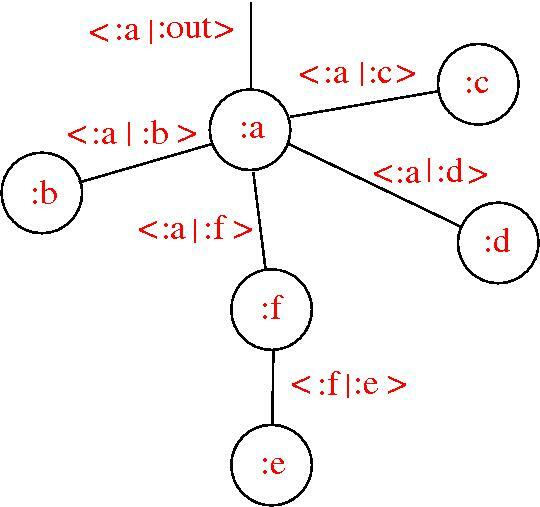 The graphic lambda calculus + actors proposes that the rewiring alone is a form of computation, one related to pure local reduction, while the signal transmissions are related more to evaluation aspects. 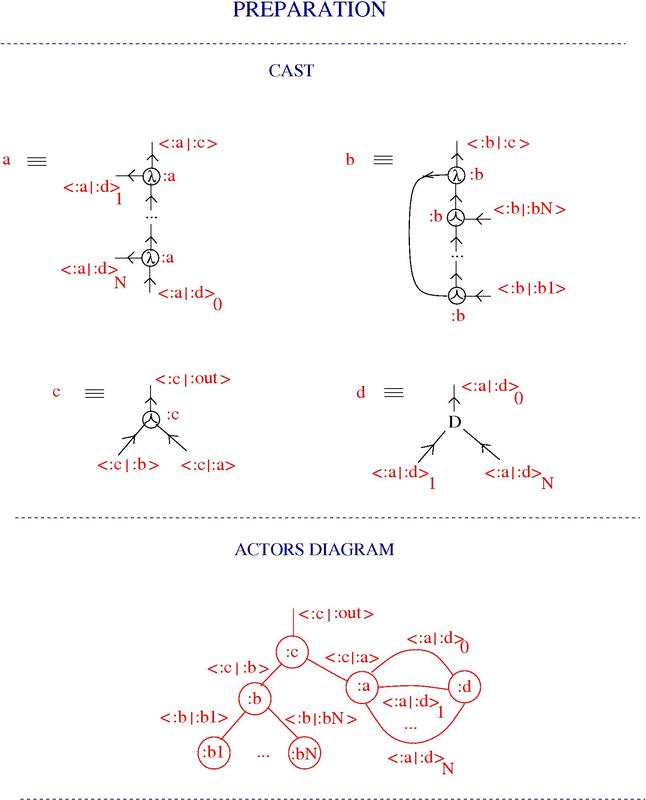 In this respect, neurons (or maybe family of neurons nurtured by one glial cell) are actors and the physical neural network is like an actors diagram. 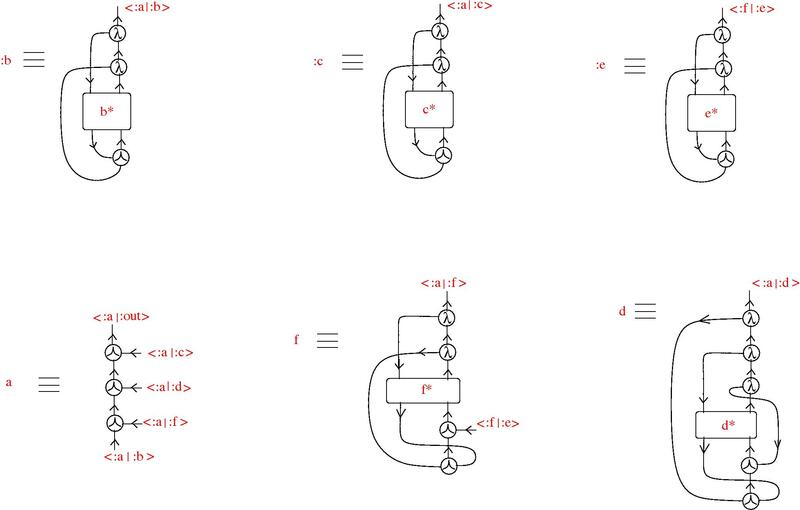 This is an illustration of a sequential computation with actors and graphic lambda calculus, based on the ideas from Actors for the Ackermann machine . It describes the inverse of the currying process described in Currying by using zippers and an allusion to the cartesian theater. Without further ado, let’s watch the play. The preparation consists in introducing the cast and the initial actors diagram. The play starts. The actor introduces to and dies, or maybe goes playing elsewhere. We see the states of the actors and , the other main character is waiting for his line, while the figuration wait in the back of the stage, in artful positions. The rest of the process consists in unzipping a graphic lambda calculus zipper. Zippers are very useful, because the unzipping process is sequential, i.e. it can happen in only one way. Therefore, by using zippers we can force a naturally distributed parallel computation to happen in a sequential way! At the end of the computation, the two actors and , which represent the two parts of the zipper, cancel one another. 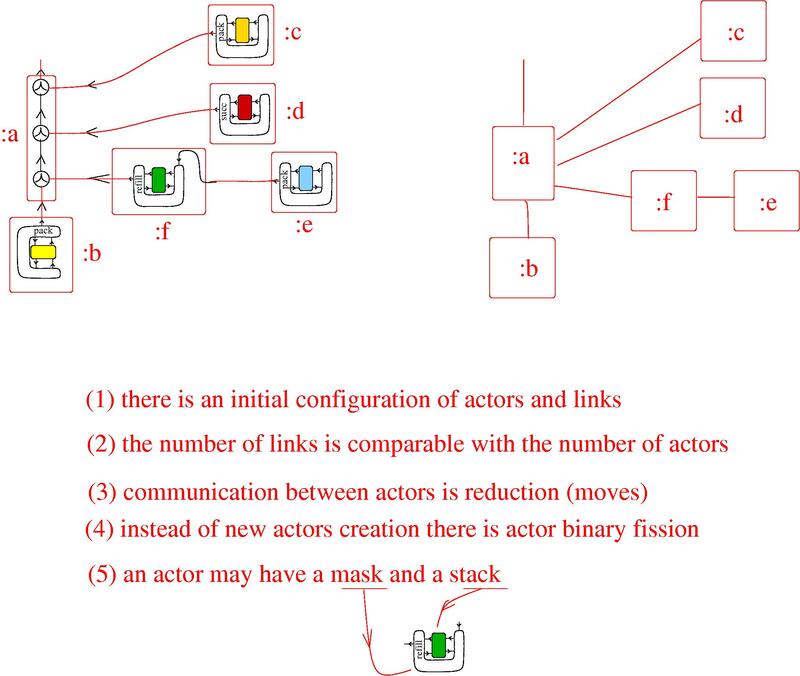 Eventually the graph is now connected with the output to the address and with the inputs to the (addresses of the) figuration actors . The graph corresponds to the graph from the post Currying by using zippers and an allusion to the cartesian theater and the computation just described is a reversed computation of the one described in the mentioned previous post. As a side remark, graphic lambda calculus suggests that currying and un-currying should be eliminated at the preparation stage of a distributed computation. 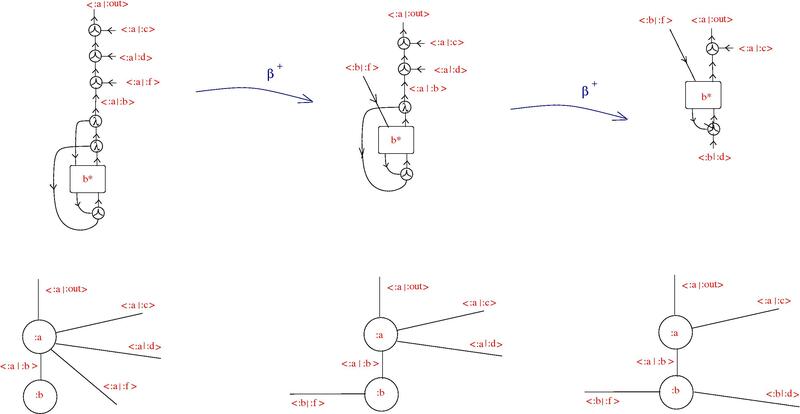 However, I took this example of computation with actors and GLC as a simple illustration and also for stressing that zippers can impose, if needed, an order of reduction moves in GLC. Actors for the Ackermann machine (II) Pure communication. Continues from Actors for the Ackermann machine . In this post we see the first interaction between the actors. Notations: each actor has an address and a stack . Only with can interact (i.e. the only moves in GLC which may happen between actors are those between the mentioned ones). Their interaction is a form of pure communication (via the graphic beta move). Two such moves are possible, in succession. This is described in the next figure, along with the changes in the actors configuration. The performance is thrilling: the actor is almost exhausted after forcing the actor to drop down his mask. In the process lost his friends and (with his buddy ) in favour of . Only is still taking the side of . What will happen next? At this stage, no other interaction is possible without revealing what is really thinking (what’s in his stack ). The first act is over. Continues A machine for computing the Ackermann function in graphic lambda calculus , by a preliminary analysis of the proposed Ackermann machine in GLC from the Actor Model point of view. binary fission is an apt name for the replacement of the GLOBAL FAN-OUT from GLC by the DIST moves from chemlambda (because eventually I am interested in using the purely local formalism of chemlambda for the Ackermann machine). “mask” is a new name instead of the “pacman” name used in the first post on the Ackermann machine. “stack” might correspond to the “mailbox” in the actor model, but it’s internal to the actor and interacts only with the mask. All this has a working hypothesis basis, I’m thinking out loud – btw, if you look then you can also talk here 🙂 . Everything is subject to changes, remember this is an open notebook (which can also be cited as explained at the right side of the post). Recently I became aware of the research line started by Wadsworth ( Christopher P. Wadsworth, Semantics and Pragmatics of the Lambda Calculus , DPhil thesis, Oxford, 1971) and then Lamping (John Lamping, An algorithm for optimal lambda calculus reduction, POPL ’90 Proceedings of the 17th ACM SIGPLAN-SIGACT symposium on Principles of programming languages, p. 16-30) on lambda graphs and sharing graphs (see for example this article by Stefano Guerrini). 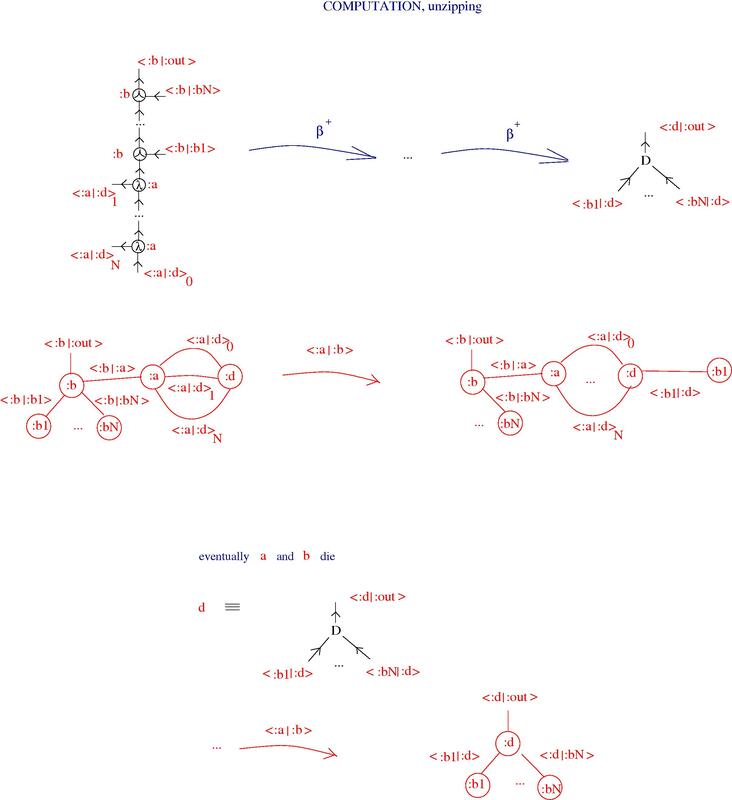 I see in Guerrini article, at page 5, a figure which is almost identical to the graphic beta move (and even more, when I shall really understand what a “mux” is, then maybe some of the moves from the middle of the page 5 will turn out to be related with the distributivity moves from the chemical concrete machine). GLC does not use any names, neither of variables, nor of terms, while in WL names are used everywhere. This looks like a minor difference but instead is very important and here is why. If we live by the “no names” rule then forget about evaluations, in particular forget about evaluation strategies and about using the result of an evaluation for deciding the next computational step. Moreover, forget about representing the state of a computation by a “value”, whatever value might mean. Does it start to look strange? It gets even weirder: forget about thinking in terms of flowcharts with nodes which represent operations (like application and lambda abstraction), which have inputs and outputs like wires which allow propagations of signals. After all forget about this signal idea. Can you? GLC can. there is a sector of GLC which is made by graphs resembling the lambda graphs from WL, however, there is no effort made in GLC to work only with this sector, while a big deal of effort in the WL approach consists in finding ways to select those “valid” lambda graphs. In GLC there is no need to restrict only to well constructed lambda graphs. this gives an advantage which GLC has over WL, namely that GLC has also other sectors, different from the one of lambda graphs, where the graphic beta move can be applied outside lambda calculus. One of this sectors is particularly interesting: is the sector containing knot and tangle diagrams, which allows GLC to interact with Kauffman Knot Logic and Knot Automata. 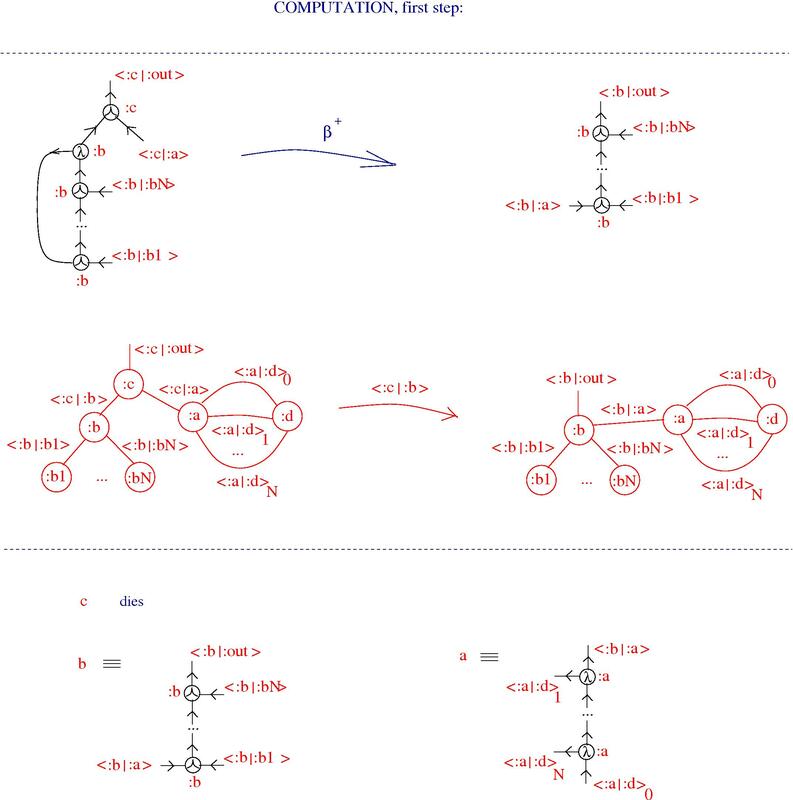 Thus GLC is a formalism which can be used for lambda calculus but also for other types of nonstandard computing models, like Kauffman’s Knot Logic. Otherwise, there are many things to learn by a geometer like me, from previous work. There are certainly many geometric things to be learned by CS experts as well, because there is more and more clear that computation needs some notion of space, besides the boringly trivial one dimensional one. In the post WWW with Metabolism and The chemical connectome of the internet was evoked the idea of using the chemical concrete machine not on biological, wet networks (although I still find this line of research very promising), but on the www. I am very happy to see that efforts concerning the use of chemical programming and bio inspired models of programming already exist! In this paper we introduce a molecular biology inspired execution model for computer communications. The goal is to lay the ground for automatic network adaption and optimization processes as well as the synthesis and evolution of protocol implementations. Our execution model is based on the unification of code and data, featuring a single unit called “fraglets ” that are operands as well as operators. We have built a simulator and started to program classical communication tasks with fraglets that show metabolistic pathways patterns like the ones found in biological cells. We give an example of a fraglet implementation for a non-trivial flow–control–with–reordering protocol and briefly discuss how to search the fraglet program space with genetic algorithms. I like very much two things here: “unification of code and data” and the “metabolistic” word in the title. Lidia Yamamoto is another researcher who works in the (finished?) BIONETS collaboration, with Biochemically inspired emergent computation, co-authored with Thomas Meyer. Also, with Christian Tschudin, “A metabolic approach to protocol resilience” (here, from p. 191). Of course, Banatre is the first who introduced the concept of “chemical programming” and Berry with Boudol the CHAM, or the chemical abstract machine. (Recall that the “chemical concrete machine” denomination points to the CHAM, but it is “concrete” because really it works with “concrete” molecules, involved in “concrete” chemical reactions, without using any name (or name management), and without the need for evaluation in the computation).